Quijano was replaced as an ARENA candidate by Edwin Zamora. 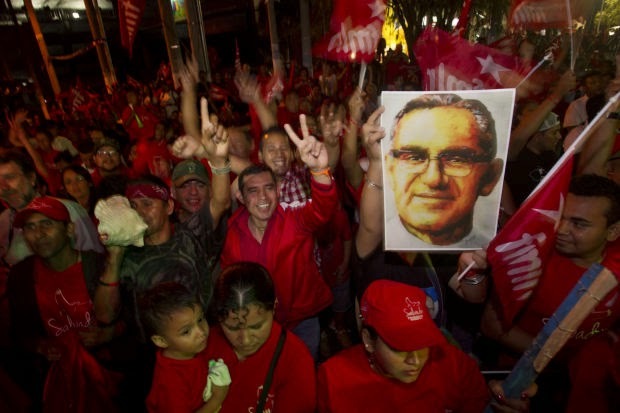 Zamora has proposed that if elected mayor of San Salvador, he would erect a monument to Oscar Romero in the capital. The political leadership of ARENA also announced to the media that it was backing Zamora's proposal for a Romero monument and plaza and stated that the martyred bishop was an important historic and religious leader in the country. Jorge Velado, part of ARENA's top leadership, lamented hypocritically, that the beatification of Romero, was being used by persons for political ends. Meanwhile Roberto D'Aubuisson, Jr., is running to be elected as the mayor of Santa Tecla. In an interview, he stated that the assassination of Oscar Romero (for which the UN Truth Commission gave responsibility to the candidate's father) was a "horrific" event. But he said that it was also "horrific" for witnesses to blame his father when his father was not there to defend himself. The candidate for mayor defended Quijano's proposal to rename a street for the elder D'Aubuisson, because his father had been the president of the National Assembly in 1983 when it adopted the present Constitution. He asserted that it was common for important political figures such as Schafik Handal and Domingo Monterrosa (military commander of the massacre at El Mozote) to have public spaces named for them. Despite the amount of hot air blowing around these issues, I don't think it swings votes. Salvadorans know the histories of their political parties and have already made up their minds whether that history is important or not. Salvadoran cartoonist Otto had a funny take on this, with a caricature of D'Aubuisson Sr., ARENA flag behind him, giving the fascist fist in the air salute, holding a sign that says "#WeAreAllRomero"